Opening the Item Menu: To first open your item menu, click on yourself and select "Items" from the menu list. Using an Item:To use your item, click on the "Use" green button underneath the correct item's name. The Item screen then dissappears. PR Feature: Regular players are allowed to carry around a total of 20 items at a given time. 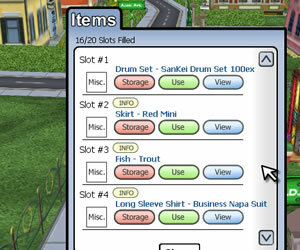 PR's, however, are given 60 item slots to carry around.